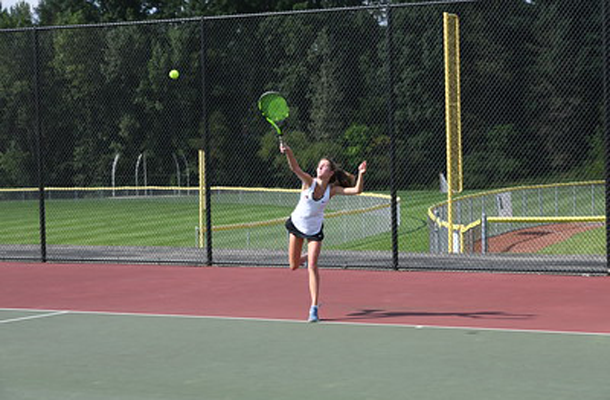 The Fox Chapel girls tennis team completed the 2018 season a few weeks ago with a loss to Mars in the first round of the WPIAL playoffs. The Foxes finished 11-4 overall and 8-1 in the section. Coach Alex Slezak is optimistic about the future of the program. “The biggest surprise for me recently has been the interest and competitiveness for the girls tennis program,” he said. “We had 36 girls try out for the team, and only the top 20 made it. Our past successes and environment has made tennis at Fox Chapel something that players have to work really hard at. It means a lot for them to make the team. The Foxes will lose two seniors from this year’s team — Kristen Friday and Leah Fetting. One question for the 2019 season will be if Charlotte James returns for her senior season after sitting out this year. This year’s losses were to WPIAL Class AA champion Sewickley Academy, Class AAA runner-up Shady Side Academy and Class AAA playoff qualifiers Upper St. Clair and Mars. Slezak wants to beef up the nonsection schedule. “I would like to schedule nonsection matches against North Allegheny, Mt. Lebanon, Upper St. Clair, Pine-Richland, Sewickley Academy and Peters Township to have a more competitive and challenging schedule,” he said. Leading the way for next year’s team will be Carissa Shepard, Lexi Quackenbush, Katie Voigt and Baylin Bitar, who were all qualifiers for the WPIAL doubles championships. Shepard, Voigt and Bitar are freshmen, and Quackenbush is a sophomore. Also expected to return are sophomores Emily Fera, Paige Theoret and Molly Dean and freshman Anna Ferris. Facility: Marshall Middle School Visit foxchapelarea.bigteams.....04824 for more information! Facility: Franklin Regional HS Visit foxchapelarea.bigteams.....40034 for more information! Facility: Butler High School Visit foxchapelarea.bigteams.....44061 for more information! Facility: FCHS - Baseball Field Visit foxchapelarea.bigteams.....40050 for more information! Facility: FCHS Burk Stadium Visit foxchapelarea.bigteams.....77346 for more information! Facility: Butler High School Visit foxchapelarea.bigteams.....44075 for more information! Facility: FCHS New Gym Visit foxchapelarea.bigteams.....45547 for more information! Facility: FCHS Burk Stadium Visit foxchapelarea.bigteams.....77359 for more information! Facility: FCHS New Gym Visit foxchapelarea.bigteams.....45553 for more information! Facility: Pine Park Visit foxchapelarea.bigteams.....14716 for more information! Facility: Hartwood Elementary Visit foxchapelarea.bigteams.....04507 for more information! Facility: FCHS - Baseball Field Visit foxchapelarea.bigteams.....40059 for more information! Facility: Herb Field Visit foxchapelarea.bigteams.....40072 for more information! Facility: North Alleg - Intermediate Baseball Field Visit foxchapelarea.bigteams.....11254 for more information! Facility: Plum HS Visit foxchapelarea.bigteams.....44182 for more information! Facility: FCHS Burk Stadium Visit foxchapelarea.bigteams.....77366 for more information! Facility: Plum HS Visit foxchapelarea.bigteams.....44211 for more information! Facility: FCHS Burk Stadium Visit foxchapelarea.bigteams.....65546 for more information! Facility: FCHS Tennis Courts Visit foxchapelarea.bigteams.....27680 for more information! Visit foxchapelarea.bigteams.....15895 for more information! Facility: Mellon MS Field Visit foxchapelarea.bigteams.....11268 for more information! Facility: FCHS Tennis Courts Visit foxchapelarea.bigteams.....57604 for more information! Facility: DMS - Baseball Field Visit foxchapelarea.bigteams.....15097 for more information! Facility: FCHS Burk Stadium Visit foxchapelarea.bigteams.....00389 for more information! Facility: Seneca Valley Middle School Visit foxchapelarea.bigteams.....07623 for more information! Facility: Seneca Valley Middle School Visit foxchapelarea.bigteams.....07617 for more information! Facility: Woodland Hills High School Visit foxchapelarea.bigteams.....40115 for more information! Facility: FCHS - Baseball Field Visit foxchapelarea.bigteams.....40112 for more information! Facility: Anderson Field Visit foxchapelarea.bigteams.....04670 for more information! Facility: McIntyre Elementary Visit foxchapelarea.bigteams.....44253 for more information! Facility: McIntyre Elementary Visit foxchapelarea.bigteams.....44236 for more information! Facility: Seneca Valley High School Visit foxchapelarea.bigteams.....77373 for more information! Facility: Seneca Valley High School Visit foxchapelarea.bigteams.....77380 for more information! Visit foxchapelarea.bigteams.....15904 for more information! Facility: Greater Latrobe Jr and Sr High Visit foxchapelarea.bigteams.....76609 for more information! Facility: Pine Park Visit foxchapelarea.bigteams.....11288 for more information! Facility: FCHS Burk Stadium Visit foxchapelarea.bigteams.....77383 for more information! Facility: FCHS Burk Stadium Visit foxchapelarea.bigteams.....77393 for more information! Facility: North Hills HS Visit foxchapelarea.bigteams.....45626 for more information! Facility: North Hills HS Visit foxchapelarea.bigteams.....45646 for more information! Facility: FCHS - Baseball Field Visit foxchapelarea.bigteams.....40135 for more information! Facility: Penn Hills H.S. Visit foxchapelarea.bigteams.....40133 for more information! Facility: Woodland Hills Jr High School Visit foxchapelarea.bigteams.....04516 for more information! Facility: Wenjover Middle School Visit foxchapelarea.bigteams.....24642 for more information! Facility: FCHS - Softball Field Visit foxchapelarea.bigteams.....44392 for more information! Facility: North Allegheny- Carson Visit foxchapelarea.bigteams.....15138 for more information! Facility: FCHS Burk Stadium Visit foxchapelarea.bigteams.....77431 for more information! Facility: FCHS - Softball Field Visit foxchapelarea.bigteams.....44410 for more information! Facility: Butler High School Visit foxchapelarea.bigteams.....77438 for more information! Facility: FCHS Burk Stadium Visit foxchapelarea.bigteams.....77420 for more information!